Avalon Interface Verification IP provides an smart way to verify the Avalon Interface component of a SOC or a ASIC. The SmartDV's Avalon Interface Verification IP is fully compliant with Intel's Avalon Interface Specification. VIP includes an extensive test suite covering all the possible scenarios. Compliant with Intel's Avalon Interface specification. Supports all address and data widths. Supports all Typical, Pipelined and Burst transfer types. Components support fine grain control of response per address or per transaction. Supports to connect individual or group of non avalon signals. Supports to reduce the number of signals and pin count. Supports point to point connection between two systems, one generating an interrupt and another receiving it. Supports constrained randomization of protocol attributes. Programmable wait states or delay insertion. Ability to inject errors during transaction. 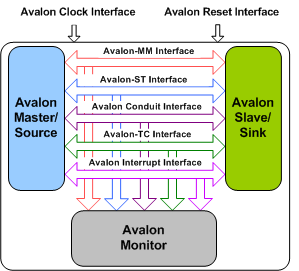 Rich set of configuration parameters to control Avalon Interface functionality. Callbacks in components and monitors for various events. Status counters for various events on interface. Avalon Interface Verification IP comes with complete testsuite to test every feature of Intel's Avalon Interface specification. Faster testbench development and more complete verification of Avalon Interface designs. Easy to use command interface simplifies testbench control and configuration of master and slave. SmartDV's Avalon Interface Verification env contains following. Complete regression suite containing all the Avalon Interface testcases.